This landscape is so smooth and rounded that you can easily imagine the ice that must have covered it some 20,000 years ago. And the ice must have been deep! Look halfway up the mountain in the foreground on the left; it shows a distinct change of rock weathering akin to a bathtub ring–and the ring persists around much of the photo. It likely marks the upper surface of the ice at maximum glaciation. 1.4 billion year old granite intruding 1.7 billion year old gneiss in Rocky Mtn National Park. 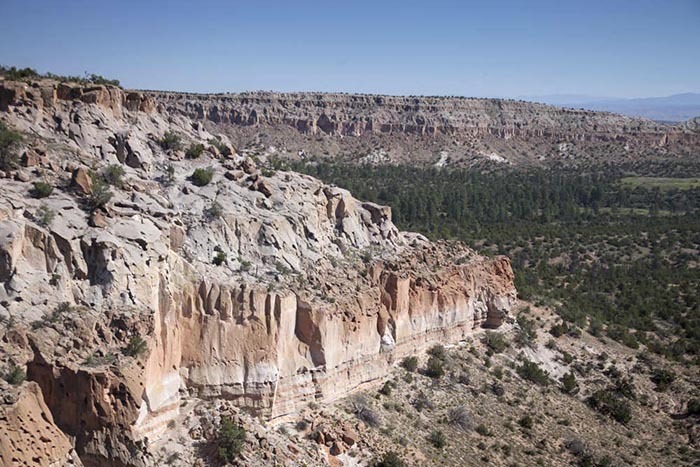 As it turns out, the “Great Unconformity”, the contact between Cambrian sedimentary rock and the underlying Precambrian basement rock, is a regional feature –it’s not only in the Grand Canyon, but found all over the Rocky Mountain West –and for that matter, it’s even in the midwest. As an example, here are a couple photos from the Teton Range in Wyoming. The yellow arrow points to the contact between the Cambrian Sandstone and underlying Precambrian metamorphic rock... the Great unconformity. This top photo shows the Grand Teton (right) and Mt. Owen (left) in the background… in the foreground, you can see a flat bench, which is underlain by flat-lying Cambrian sandstone. Below that are darker-colored cliffs of Precambrian metamorphic rock. 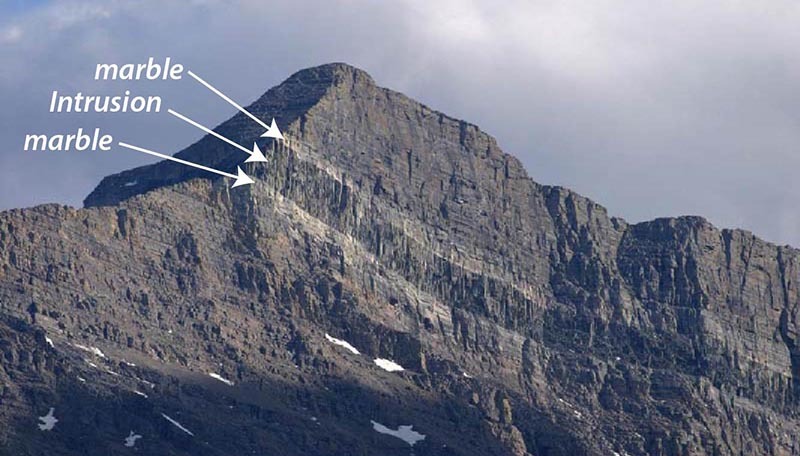 The unconformity is right at their contact (arrow). Also notice that the Grand Teton and Mt. Owen are made of metamorphic (and igneous) rock –but they’re much much higher in elevation than the sandstone. That’s because there’s a fault, called the “Buck Mountain fault” that lies in-between the two. 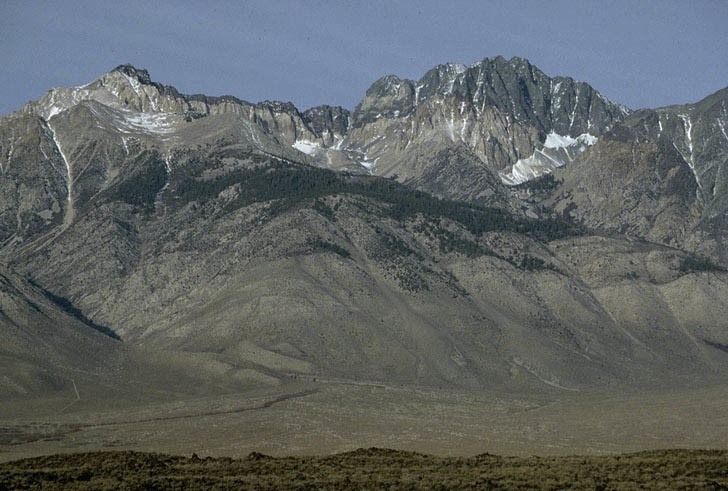 The Buck Mountain fault moved the rock of the high peaks over the ones in the foreground during a mountain-building event at the end of the Mesozoic Era. Because the metamorphic and igneous rock is so much more resistant to erosion than the sandstone, it stands up a lot higher. Precambrian metamorphic and igneous rock of the Teton Range and overlying sedimentary rock. This lower photo shows the view of the Teton range from the top of the sandstone bench (appropriately called “Table Mountain”). As you look eastward towards the range, you can pick out the Buck Mountain fault (between the metamorphic and igneous rock of the high peaks) and the Cambrian sedimentary rock (the layered rocks). Significantly, the Cambrian rocks, just like in the Grand Canyon, consist of sandstone, overlain by shale, overlain by limestone. And geologic time… remember… for the sandstone to be deposited on the metamorphic or igneous rock, the metamorphic and igneous rock had to get uplifted from miles beneath the surface and exposed at sea level. And since then, it’s been uplifted to the elevation of The Grand Teton (13370′) and Mt. Owen (12, 928′) ! Click here to see more photos of unconformities. 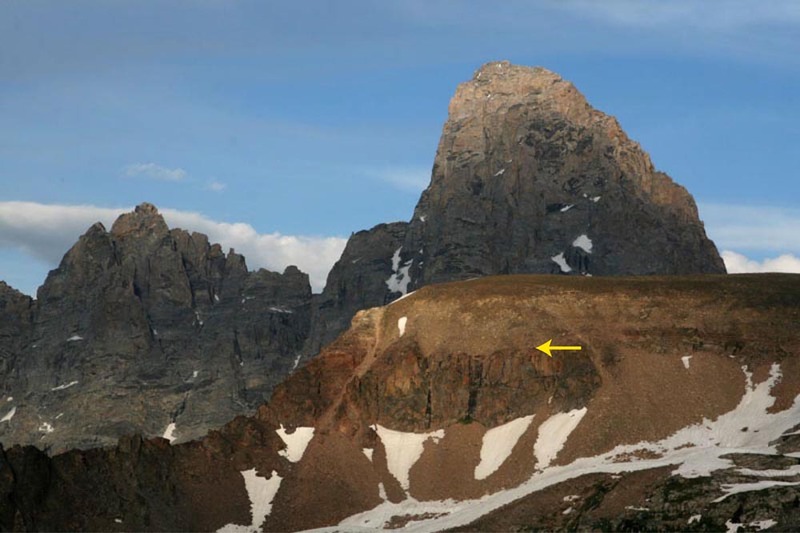 or… click here to see a geologic map of Grand Teton National Park, Wyoming. 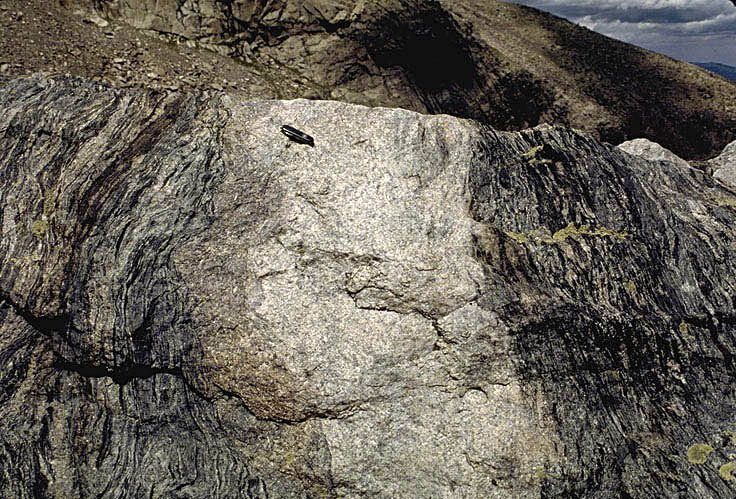 The photos from the last posting were from the Sierra Nevada Batholith –called a “batholith” because it consists of many many smaller intrusive bodies that collectively define a much larger intrusive complex that doesn’t even have a well-defined root. As it turns out, the Sierra Nevada are one of several really large batholiths that intruded the crust of the Pacific Margin during the Cretaceous Period, about 80-100 million years ago. 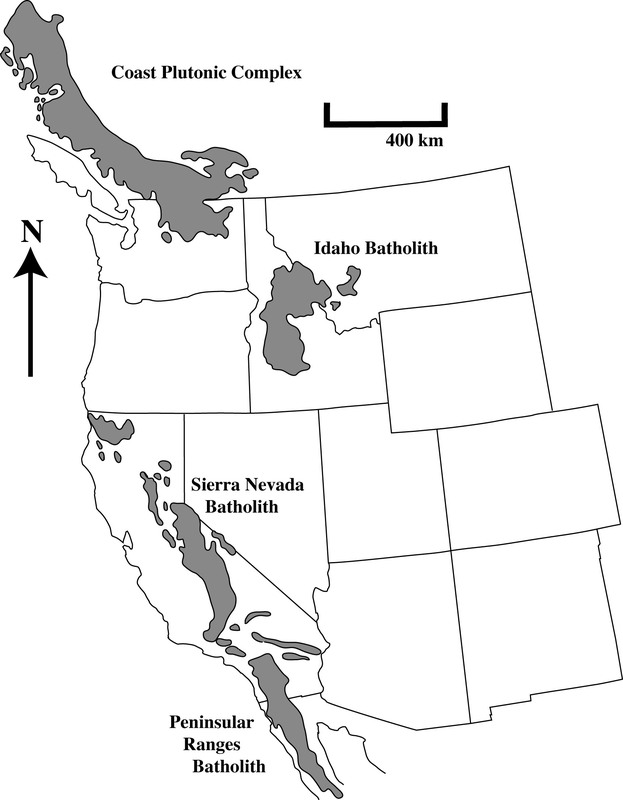 Granitic Batholiths of Cretaceous age in western North America. And along the east side of the Sierra Nevada, we can see the original rock into which the granite of the Sierra Nevada intruded. 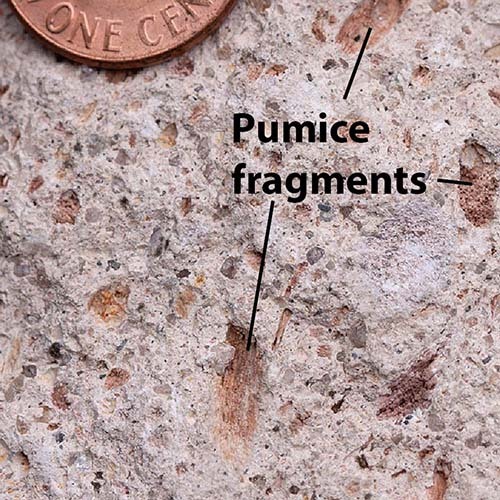 This original rock consists of older sedimentary and volcanic rock–that dates from the Cambrian Period through the Jurassic– much of which was metamorphosed by the heat from the intruding granite. The photo below shows the Cretaceous granite below (light colored rock) and the dark-colored sedimentary (now metamorphic) rock above. These older rocks that are intruded by the granite are called “roof pendants” because they show the roof of the batholith. Cretaceous granite intruding Cambrian metasedimentary rock, Sierra Nevada Range. And as far as geologic time goes, this photo shows us that the granite, discussed in previous posts, is younger than the sedimentary rock that overlies it. 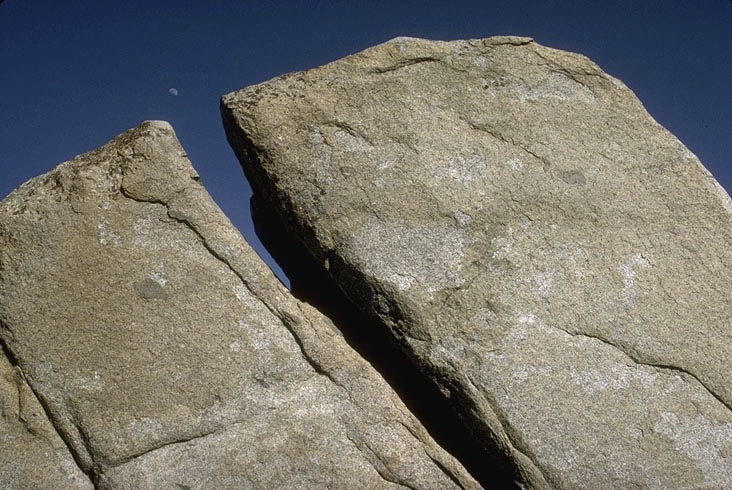 And click here to see a photo of glaciated granite in Yosemite National Park. A typical exposure of granite --coarse grained with an interlocking, random assortment of crystals. 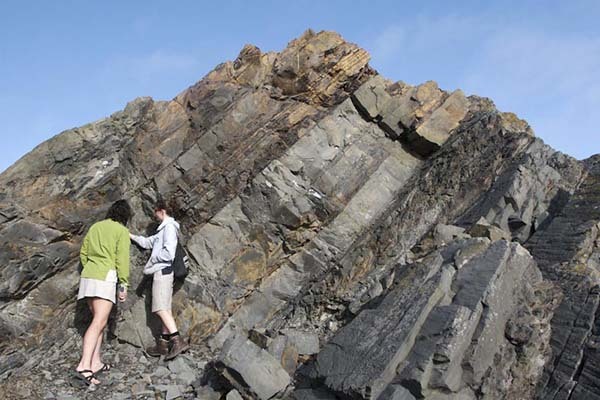 Click here to search for geology pictures by keyword. And the rock is a pretty typical example of granodiorite… which is a lot like granite, except it has a little less silica. See yesterday’s post about igneous rocks if you’re interested. 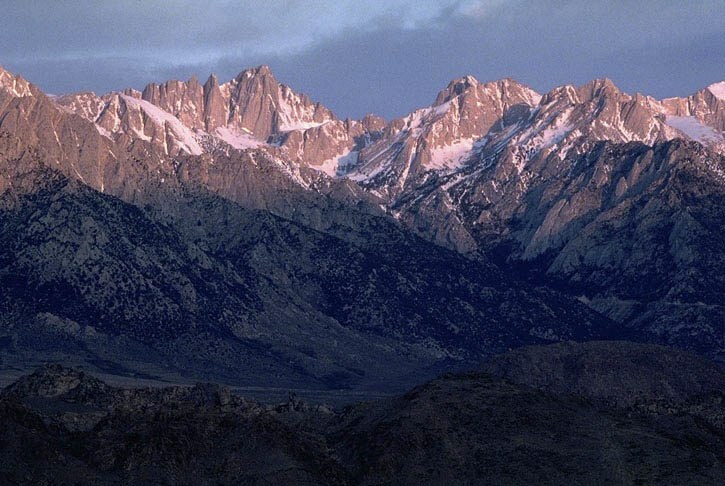 It turns out that most of the Sierra Nevada Range in California, including Mt. Whitney (the conterminous US’s highest peak) is made out of granodiorite. And if you consider that most of the magma cooled and crystallized at a depth of 10km, and now resides about 4km ABOVE sea level, we’re looking at millions of years to accomplish this uplift. Here’s Mt. Whitney at sunrise… It’s the peak just left-of center. From this view, you can see that the rock of this part of the Sierra Nevada Range is all pretty much the same: granodiorite. Mt. Whitney and Sierra Nevada, California at sunrise. Mt. 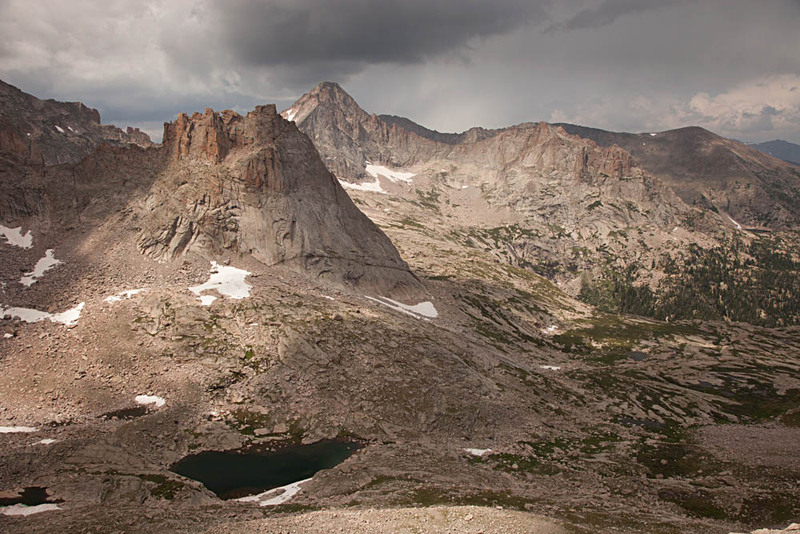 Whitney's elevation is 14, 505' above sea level, the highest spot in the conterminous US. The rock in this photograph is almost entirely granodiorite. Here are some samples of different igneous rocks. The upper photo shows intrusive igneous rocks and the lower photo shows volcanic (extrusive igneous) rocks. 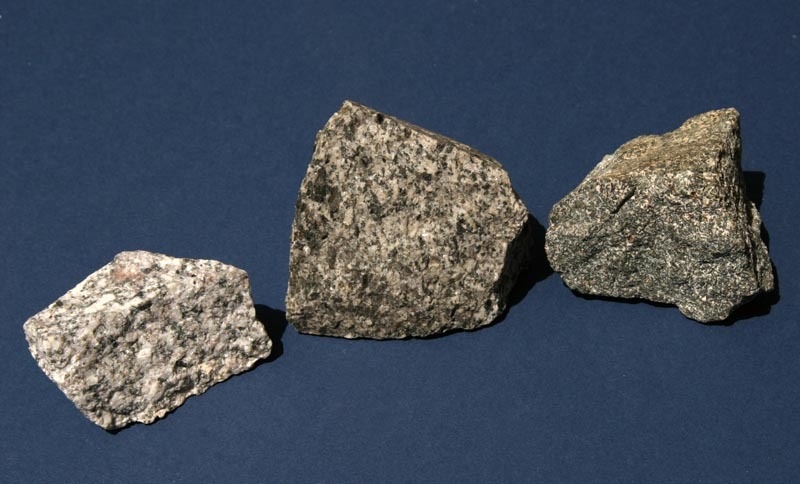 From left to right, these rocks are arranged in order of decreasing silica content: granite, diorite, and gabbro. Click here for more photos of igneous rocks and features. I can’t claim that these are the most artistic photos, but they do show a couple things about igneous rocks. First off, to be igneous, a rock needs to have cooled and crystallized from a molten state. 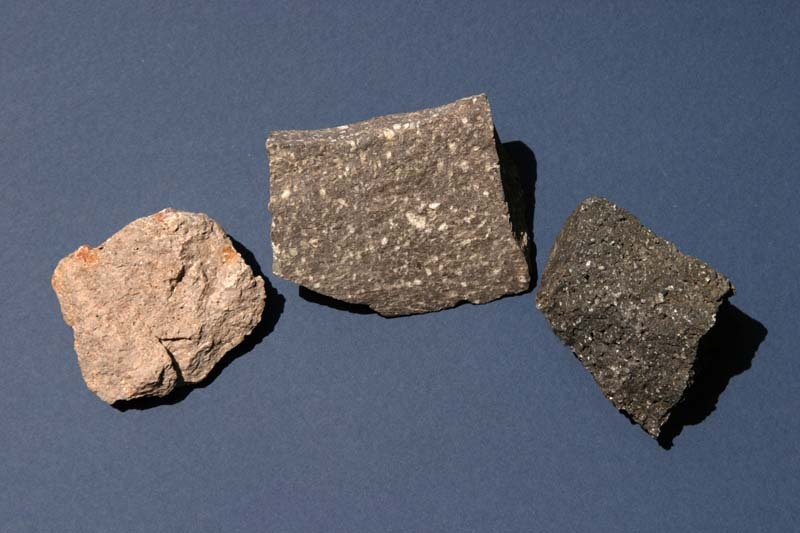 Intrusive rocks, shown in the photo above, are the type of igneous rock that cools and crystallizes within the crust; volcanic rocks, shown in the photo below, cool and crystallize on the Earth’s surface. Because they form by cooling and crystallizing, crystals in both types generally have a random orientation and an interlocking texture. You can see that in the photo above, because intrusive rocks tend to be coarse grained. It’s much harder to see that feature in volcanic rocks because they tend to be fine grained. 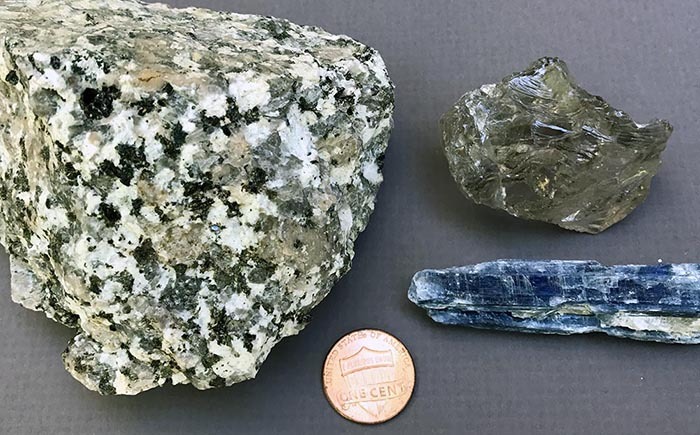 Intrusive igneous rocks are coarse-grained, and volcanic rocks are fine-grained because it takes time to grow crystals –and intrusive rocks take longer to cool and crystallize because they’re insulated by the surrounding rock. These photos also demonstrate how igneous rocks generally become lighter in color as their silica content increases and their iron content decreases. 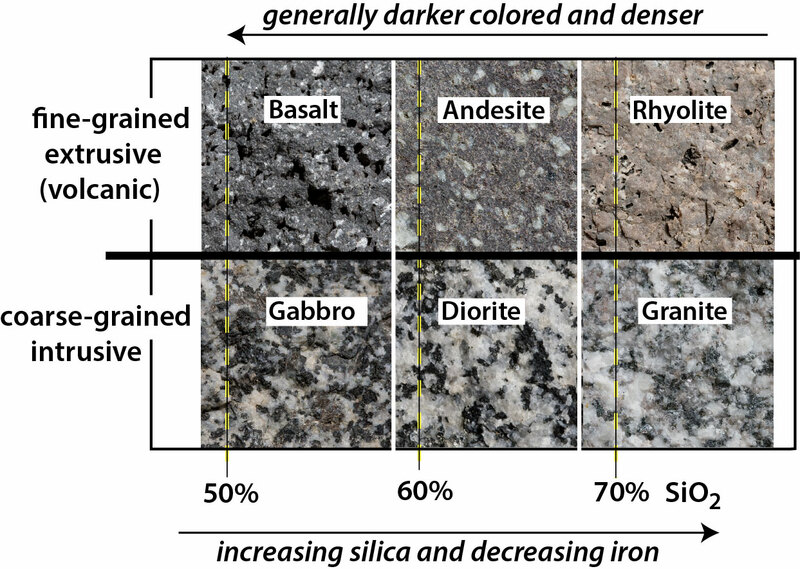 By definition, granite (left photo) has more silica than diorite, which has more silica than gabbro. Iron tends to follow silica in an inversely proportional sort of way –so the gabbro has the most iron. Same thing with the volcanic rocks. When it comes to great lengths of geologic time, the intrusive rocks are the most instructive. They form within the Earth– at depths of several kilometers to several tens of kilometers –but here are some hand samples at the surface? So the big question is, how long does it take for a rock at a depth of say, 10 km, to make it to the surface of the Earth? It depends on the rate of uplift and erosion –but really fast uplift rates are on the order of 1 meter/thousand years. That makes for 10 million years at minimum just to get these little hand samples to the surface! 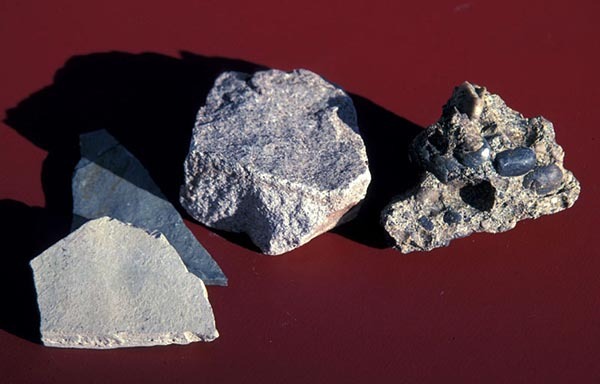 From left to right, these rocks are arranged in order of decreasing silica content: rhyolite, andesite, basalt. Click here for more photos of volcanic rocks and features.